North of the Canadian town of Whitehorse, Yukon River expands into Lake Laberge, Marsh Lake and Lake Atlin. Other large lakes that are part of the Yukon River system are Kusawa Lake, Takhini River and Kluane Lake, Kluane River and then into the White River. In addition to the lake and river Kluane, there is the Kluane National Park, which is listed as a UNESCO World Heritage Site. There are mountains in the Canadian federal Kluane Yukon territory. Kluane Lake is located in southwestern Yukon, Alaska, near the highway, about 220 km northwest of the largest city in the region - Whitehorse. With over 400 square kilometers and 70 km length, lake Kluane is the largest such body of water within the western Canadian territory. The main water source is the water sleeve A'ay Chu, which is fed by the Kaskawulsh Glacier, located within the National Park Kluane. Draining of the lake is through the eponymous river, which later on its way flows into the Donjek River, White River and the Yukon River, through which it ultimately goes to the Bering Sea. Theroad to the lake is easily accessible following the Alaska Highway, which follows most of the coast of the pool. Even during the drive, one has the opportunity to enjoy the inspiring and beautiful views of the lake and National Park. On the southern coast of Kluane are 2 small communities - Burwash Landing and Destruction Bay, where plenty of opportunities for tourism and recreation on Lake Kluane can be found. 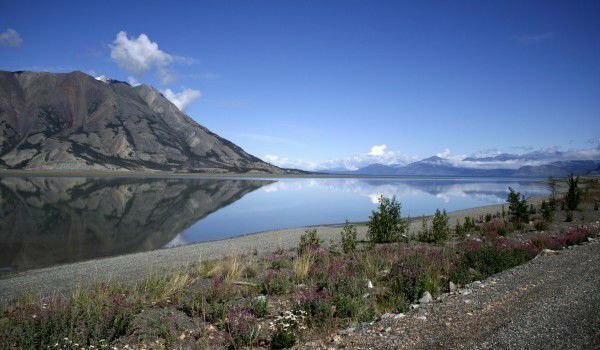 Kluane Lake is popular among fishermen for its rich populations of whitefish and trout. Among the fishermen community in Canada, Kluane is known as one of the few lakes that can be called a "Trophy Lake". This means that there can be found huge trophy fish to catch. If you did not get lucky with some such gigantic specimen, you will have to settle for something less, with a size of about 10-15 kg. Sometimes, the lucky pull out fish weighing over 30 kg. We do not know what the upper limit of weight of fish in Kluane is, but there has been trout, weighing 60 kg. In a literal translation from local languages, Kluane means "the big fish pond". There are even stories told, about a giant fish that lives in the water and in the past has caused horrific wounds from biting people. Despite these legends, today on Kluane, a canoe, kayak or boat is what takes tourists to the hut on the other side. Kluane is located 850 meters above sea level, which is a prerequisite for its icy waters, it typically freezes for about 7 months a year. There are chalets built on the northern shore of the lake, near the mouth of Talbot Creek. Here is formed something like a fjord Bay, 30 km long, known as the Talbot Arm. The area of the lake Kluane is paradise not only for passionate fishermen, but for fans of wildlife and animals. There are excellent conditions for mountain climbing and hiking in the Ruby Range Mountains, followed by the eponymous mountain Kluane, reaching a majestic 6000 m altitude. However, care must be exercised because in the hills live wolves and black bears. The variety of birds is also great - on the shores of Kluane, tourists can see many ducks, swans and geese. Kluane National Park itself begins on the other side of the lake, opposite the Ruby Range hut. The southern shore of Lake Kluane has been a place for research for many years. The richness of the lake and surrounding area allow studies in geomorphology, geology, biology, botany, zoology, hydrology, freshwater research, climatology, anthropology, archeology and more to be deployed here.